“Flossart Lemon” is a specially designed concentrated, flavored sugar for cotton candy making. This product is a blend of refined sugars with artificial color and flavor. “Flossart Strawberry” is a specially designed concentrated, flavored sugar for cotton candy making. This product is a blend of refined sugars with artificial color and flavor. “Flossart Green Apple” is a specially designed concentrated, flavored sugar for cotton candy making. This product is a blend of refined sugars with artificial color and flavor. “Flossart BlueRaspberry” is a specially designed concentrated, flavored sugar for cotton candy making. This product is a blend of refined sugars with artificial color and flavor. “Flossart Cherry” is a specially designed concentrated, flavored sugar for cotton candy making. This product is a blend of refined sugars with artificial color and flavor. “Flossart Banana” is a specially designed concentrated, flavored sugar for cotton candy making. This product is a blend of refined sugars with artificial color and flavor. 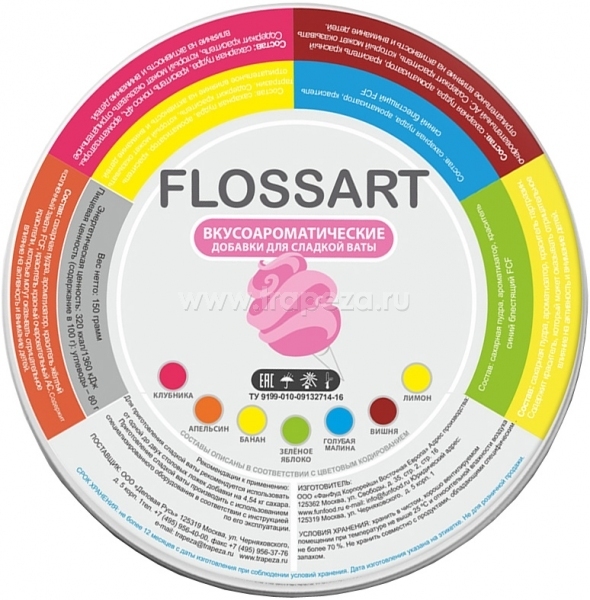 “Flossart Orange” is a specially designed concentrated, flavored sugar for cotton candy making. This product is a blend of refined sugars with artificial color and flavor.